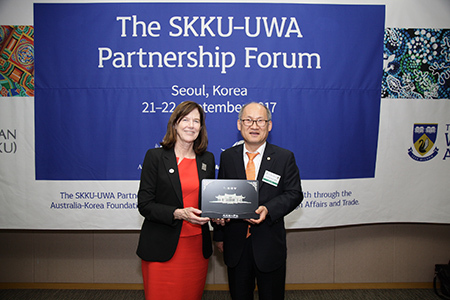 The 2nd SKKU-UWA Partnership Forum hosted by SKKU, took place on 21-22 September 2017, in Seoul. The areas of focus were Humanities and Social Sciences, East Asian Studies, Law, Physics, ICT/Mechanical Engineering, Biomedical Engineering and Medicine. This forum is partly funded by the Australia-Korea Foundation grant (Chief Investigators: Dr Jo Elfving-Hwang, Mr Iain Watt, Prof Wendy Erber, Prof Ian MacArthur and Prof Len Collard). For more information, please contact Jerline Chen. 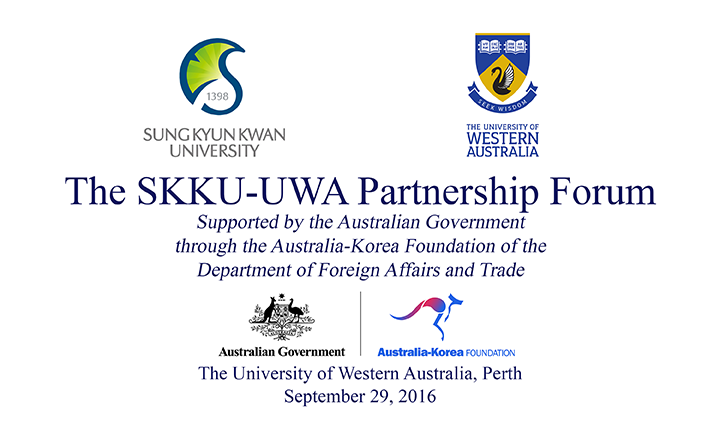 The Inaugural SKKU-UWA Partnership Forum, hosted by UWA, took place in September 2016 and consisted of a full day workshop with 3 parallel streams in the areas of Medicine and Biomedical Engineering, East Asian Studies, and Physics. The Forum aimed to identify potential synergies for teaching and research collaborations and to explore opportunities for funding joint research between the two institutions. Cancer genomics - Samsung Genome Institute, led by Professor Woong-Yang Park, is a highly esteemed and productive genome sequencing centre for cancer and there are real synergies with research being undertaken at UWA. Clinical immunotherapy - Willem Lesterhuis and Woong-Yang (later joined by Dr. Hae-Ock Lee, project leader of immune profiling in SGI) are actively exploring potential avenues where there can be mutual benefit in clinical immunotherapy, more specifically on “immune profiling in different viewpoints”. Medical education – A closer relationship can be forged between our universities in medical (and biomedical science) education through UWA’s eLearning Suites. Ultrasound imaging - Professor Karol Miller and Prof. Jinhyoung Park initially met at the joint forum and are now working on a joint project. Cancer biology – The forum led to an invittion for UWA’s Assoc/Prof Lindy Fitzgerald from the School of Animal Biology to participate in their International Symposium on Translational Medicine which was held at the Samsung Medical Center, in November 2016. This resulted in a very positive outcome as Assoc/Prof Lindy Fitzgerald is likely to collaborate with Prof Minah Suh from SKKU. Research funding application - As a result of the contacts forged through this partnership forum, Dr Jo Elfving-Hwang is leading a research funding application to the Academy of Korean Studies on the topic of ‘social aspects of ageing/political economy of ageing societies’ with SKKU as a key partner. UWA’s International Research Training Program – the School of Physics provided research training to 7 SKKU undergraduate students during Jan and Feb 2017, and places on UWA’s International Research Training Program was made available for SKKU students. SKKU graduate undertaking PhD study at UWA - It is hoped that an exchange in undergrad students will serve to increase cultural exchange and further diversity our student body and more importantly, lead to a keen interest among Korean students to undertake a PhD in Physics at UWA. A first step in this direction was recently taken when a Master-degree graduate from SKKU was awarded an IPRS for a PhD study with Professor Mikhail Kostylev’s condensed matter group.